Steven had never done anything remotely like this before. 19 and a residential student at The Center for Discovery, Steven was about to audition for Beauty and the Beast, this year’s selection for TCFD’s annual musical theatre production. This would be terrifying for anyone, but more so for Steven who — like most of those at the audition — has autism and faces challenges every day. Getting up on stage was a significant leap outside of his comfort zone. Yet on that morning in early January, Steven was not distracted nor disruptive. He was, in fact, the opposite. Calm and happy. “He was looking around and soaking up all the excitement,” says Deven Zahorsky, Steven’s teacher. “The students were laughing and encouraging one another. A few of them came over to meet him.” Swept up in the comforting energy of the room, Steven took to the stage of The Michael Ritchie Big Barn – alone – performing his interpretation of a wolf. “I was blown away,” says Deven. So was Conio Loretto, TCFD’s Senior Director of Music Therapy, who is directing the production. “He easily came onstage and surprised us all with his dramatic snarls,” says Conio. Steven is now a member of the ensemble who play villagers as well as the musical’s iconic dancing cups and plates. “The greatest news I’ve ever heard,” said his dad. In order to accommodate every actor and actress, Conio has once again adapted and revised the script to capitalize on the cast’s strengths, and also to challenge them. “Those cast members with verbal skills are given lines to deliver,” he says. “If they can say one or two words, those words become incorporated into the script. Those who can sing, sing. Those who can dance, dance. Those who use facial expressions or body language to communicate do so within the context of our songs and scenes.” It is a remarkable undertaking. Music Therapy is an integral part of the program at The Center and occurs over a variety of formats, ranging from individual therapeutic treatment sessions to participation in more traditional social opportunities, including performance groups like chorus, rock band and drumline. 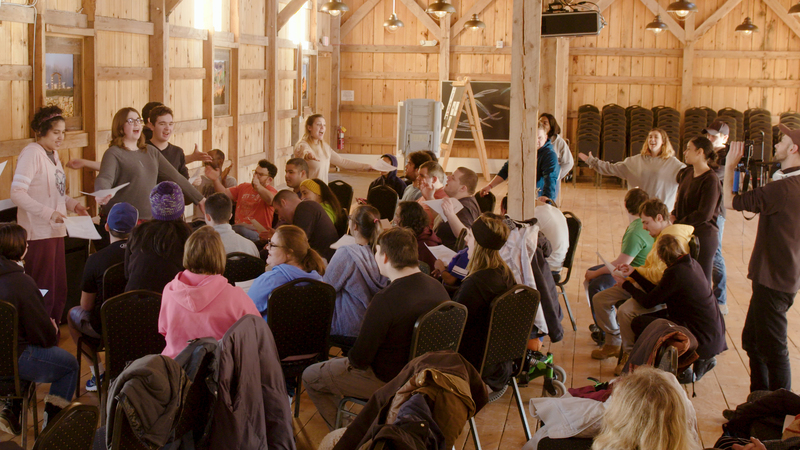 The cast of Beauty and the Beast is now in twice-weekly rehearsals until the show is staged on May 29th and 30th at The Michael Ritchie Big Barn theatre. Stay tuned for updates: we will be regularly documenting the progress of the cast and the production as they get closer to show time!